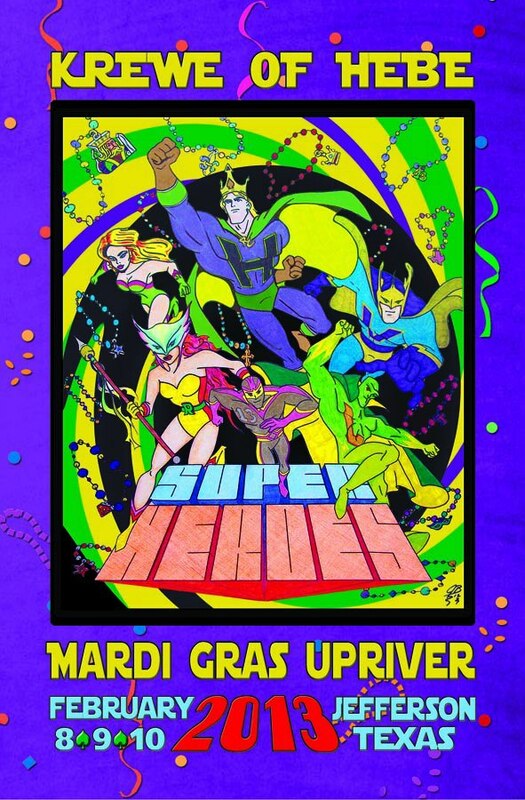 The Mardi Gras festival weekend in Jefferson is loaded with a huge assortment of activities, live bands, food and of course plenty of bead throwing. 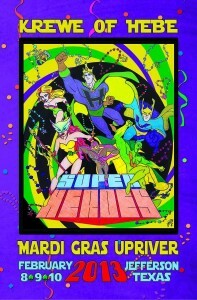 This year the KREWE OF HEBE’S 2013 MARDI GRAS UPRIVER theme is “Super Heroes”. Which one will be your costume this year? Let the fun begin, or as they say “Laissez les bons temps rouler”!! Main Stage – Nickel Beer Band 7:00 p.m. – 10:00 p.m.
Doo Dah Parade 7:00 p.m.
Main Stage – Vince Vance & the Valiants 11:00 a.m. – 2:00 p.m.
Motorcycle Parade 1:45 p.m. Grand Parade 2:00 p.m.
Main Stage – Billy Joe Shaver 3:00 p.m. – 6:00 p.m. Awards Ceremony 4:30 p.m. – 5:00 p.m.
Main Stage – Kraig Parker’s Tribute to Elvis 7:00 p.m. – 10:00 p.m.
Main Stage-The Night Hawk Band 12:00 p.m. -4:00 p.m.
Children’s Parade 2:00 p.m. Children’s Activities at the Otstott Park/Gazebo 3:00 p.m.
Wine Tastings 7:00 p.m. – 10:00 p.m.
Elvis Tribute Artist -“Josh Davis” – Show 8:00 p.m.
Wine Tastings 12:00 p.m. – 10:00 p.m.
Elvis Tribute Artist “Josh Davis” Show 6:00 p.m. – 9:00 p.m. I have listed only a few of the things to do this weekend, if you’d like more information visit our local Chamber of Commerce site. Please book your reservations for dining and lodging early.